Comatula rotalaria, copyright Teresa Zubi. Contains: Tropiometracea, Antedonacea, Solanocrinitacea, Comasterinae, Capillasterinae. 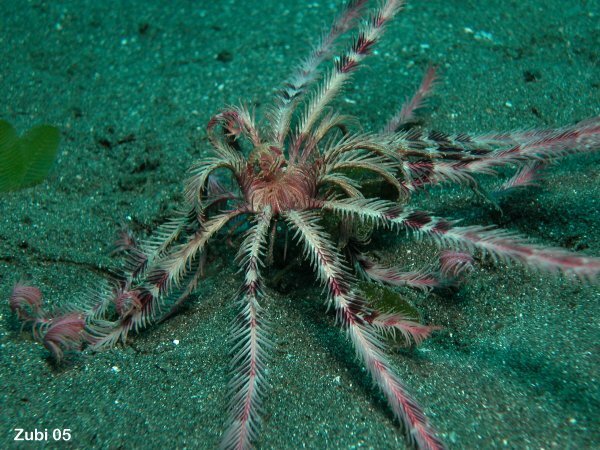 The Comatulida, feather stars, are a group of crinoids in the larval column has been reduced to a single cirriferous centrodorsal attached to the calyx (Wienberg Rasmussen 1978). They are the most prominent crinoid group in the modern fauna. [BLWR78] Brower, J. C., N. G. Lane & H. Wienberg Rasmussen. 1978. Postlarval ontogeny of fossil crinoids. In: Moore, R. C., & C. Teichert (eds) Treatise on Invertebrate Paleontology pt T. Echinodermata 2. Crinoidea vol. 1 pp. T244–T274. The Geological Society of America, Inc.: Boulder (Colorado), and The University of Kansas: Lawrence (Kansas). [MMR78] Macurda, D. B., Jr., D. L. Meyer & M. Roux. 1978. The crinoid stereom. In: Moore, R. C., & C. Teichert (eds) Treatise on Invertebrate Paleontology pt T. Echinodermata 2. Crinoidea vol. 1 pp. T217–T228. The Geological Society of America, Inc.: Boulder (Colorado), and The University of Kansas: Lawrence (Kansas).